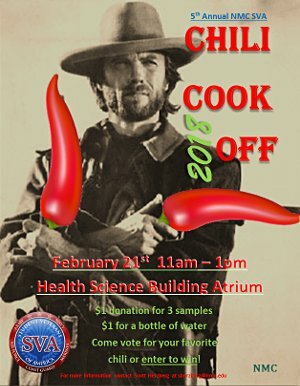 February 21, 11 a.m.–1 p.m.
Come to the annual chili cook off benefiting NMC veterans, which is sponsored by NMC’s Student Veterans of America (SVA). ANYONE can enter. For more information including rules and an entry form, contact Scott Herzberg at sherzberg@nmc.edu. Come vote for your favorite chili or enter to win!